Ever wanted to access digital media such as music, YouTube videos, your own photos and lots of others stuff through an Apple TV set-up. So did I after seeing one demoed at an exhibition. 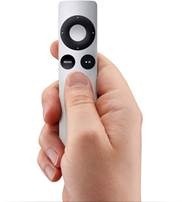 But, suppose for the moment you have a cerebral palsy condition or limited hand mobility; if so, that may prevent you from using the small button remote that operates the Apple TV. Normally that would be a problem; but not anymore. There’s a very simple solution based on the Domino Universal infra-red remote. I’ve taught Domino the control codes used by the Apple TV remote to navigate around the menu. 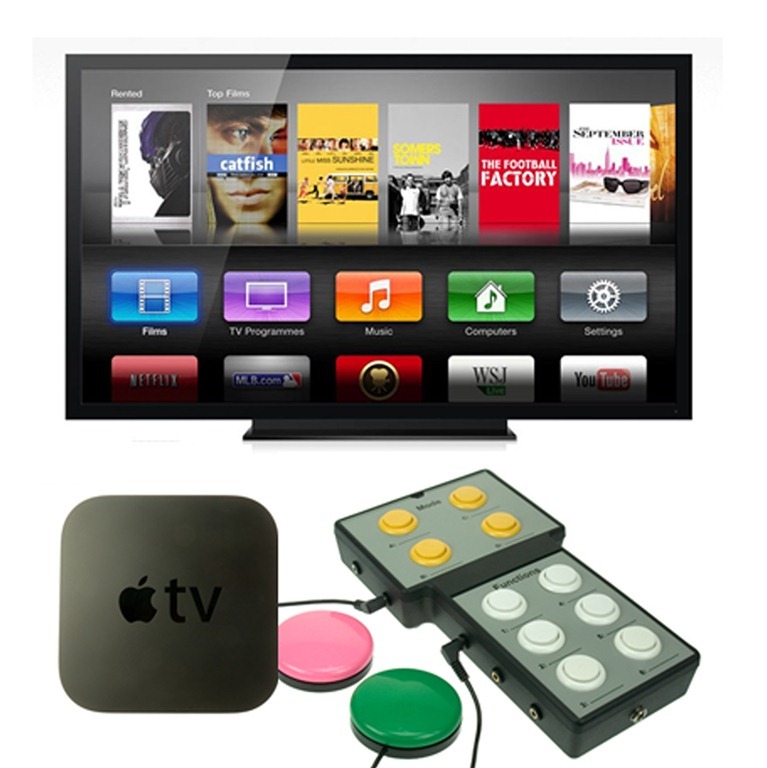 Now, everything you need to do using the Apple remote can be done by Domino. With the added advantage of the large buttons or switch accessibility for those users that prefer or need to use switches. Get in touch through our contact page if you have questions. Mongo the Gorilla, Cowley the Cow, Nurserytime Bear and Arnold the Snoring Pig switch adapted toys. These are the comments we received from focus group evaluations co-cordinated by Carole Burton (Editor, Good Toy Guide) at the National Association of Toy and Leisure Libraries. We had some fantastic news earlier this week; our switch adapted toys have been awarded “Overall Winner” status in the “Inclusive Play” section of the 2009 Good Toy Guide. The Good Toy Guide is published every year by the National Association of Toy and Leisure Libraries (NATLL) and will be available in October as a download from their website.